Family oral tradition indicates that the Bishirs originally came to America from Alsace-Lorraine and settled first in Pennsylvania. Jeremiah’s birth is cited for 1800 in York County, PA in several references and the census does show a Christian Bisher living there in Monaghan Township in 1800, with a wife and six very small children. Major Christopher Bishir Jr.’s grave marker indicates he was born in Westmoreland in 1805. So it seems likely that the family moved west across Pennsylvania prior to 1805. Judging from the birth dates and locations of his children, sometime between 1805 and 1810, Christopher Bishir began his trek from Pennsylvania into the western wilderness. 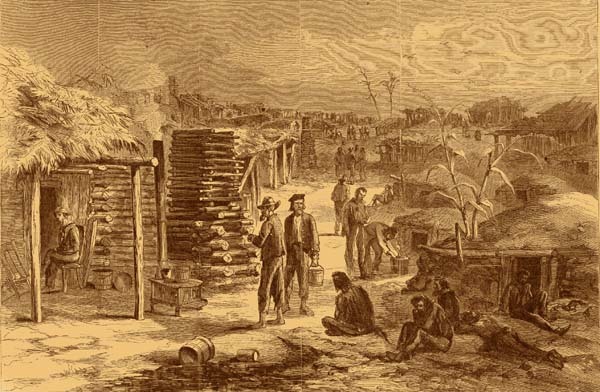 At the start of the 19th century settlers intent on moving west from Pennsylvania, Virginia, New Jersey, and Maryland were increasingly looking toward the Ohio frontier. 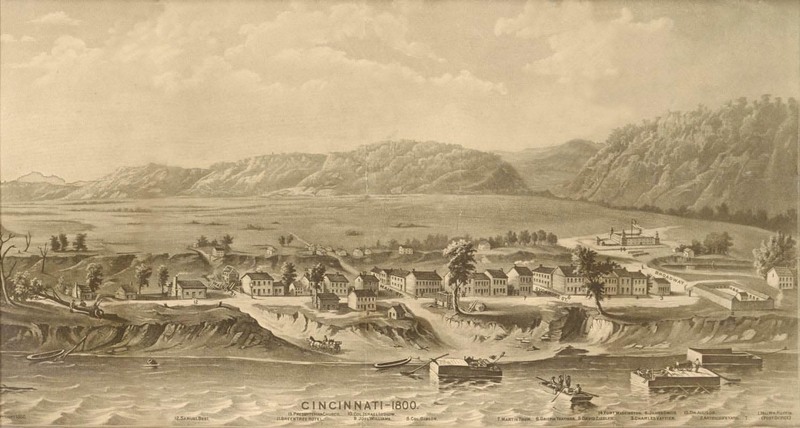 The last of the conflicts with the Indians of the region were concluded by the mid 1790s, and some hardy settlers had already moved in to claim lands as part of the Virginia Military Reserve between the Great and Little Miami Rivers, north of modern-day Cincinnati. The Reserve, set aside by Congress to reward Virginia’s veterans from the War for Independence, contained some of the richest farming land in the Northwest Territory. 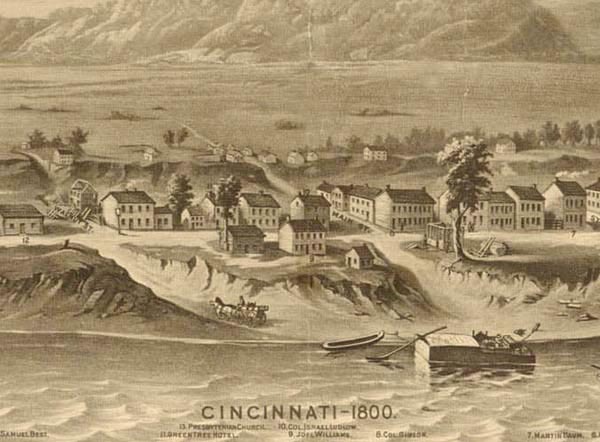 A frontier outpost had been established at Cincinnati for several years, and by the time Ohio achieved its statehood in 1803, Cincinnati was already a bustling port on the Ohio River, where emigrants stopped over prior to striking north into Ohio’s interior. For the most part, emigrants of the time were subsistence farmers, scarcely educated and, although considered middle-class for the day, quite modest of means. 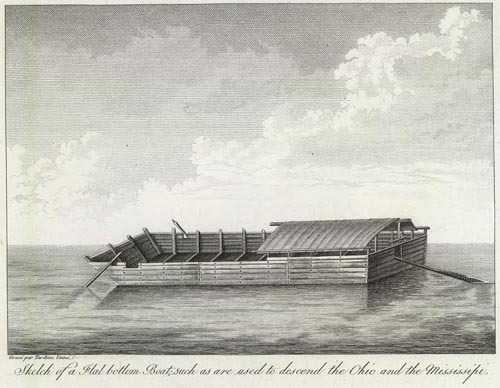 Most could not afford to hire a flatboat to carry their family and possessions to the western lands by way of the Ohio River. Consequently, they made the trip overland, with a variety of conveyances, following “roads” cut through the wilderness by pioneers who had gone before. One such route that might have been traveled by the Bishir family was Zane’s Trace, named for Col. Ebenezer Zane who had lobbied congress to finance a more direct path to Kentucky and the Northwest Territory. The trace began at Wheeling in Virginia (now West Virginia), and traversed 230 miles across the southern part of Ohio, terminating at the Ohio River opposite Maysville, Kentucky. A “Christly Bysher” first appears in the census of 1810 in Campbell County, Kentucky, near the Ohio River nearly opposite Cincinnati. He is married and reports a family of from 9 to 12 persons (the count of the little girls under 5 is smudged and difficult to read). 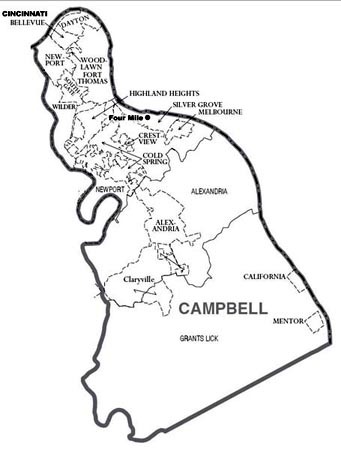 He is listed in the tax rolls of 1811 and 1812 and 1813 for Campbell Co., tending 153 acres near Four Mile Creek. A Zachariah Bishare is listed in the same tax roll for 1812, although we do not know how, or if he was related. Jonathan Bishir was born there in 1811. A bill of sale between Christopher and her eldest son, Jacob, was found in Hamilton Co. in 1816, so sometime between 1813 and 1816 the family moved across the Ohio River into Ohio. Elsie Johnson Ayers' book, book, Highland Pioneer Sketches and Family Genealogies, indicates the family stopped over for a time near the mouth of the Crawfish River. The Crawfish drains into the Ohio River a few miles upriver from Cincinnati (near present-day Columbia, Ohio) However, it's possible the reference could have been a description of their location in Kentucky which was nearly opposite the mouth of the Crawfish. By 1816 they had moved to rented land in Springfield Township, Hamilton County, several miles north of Cincinnati, and they next appear in the records of adjacent Warren County near Mason, Ohio. Although Christopher does not feature in these records, three of his sons, Jacob, Jeremiah and John and his daughter Elizabeth were married there, and there are records of land transactions that indicate the family spent most of the 1820s in Warren County. Our list of Chrisopher’s children is somewhat conjectural, however only John, Jeremiah, and Simeon are not specifically mentioned either in a family bible or the Ayers biography. Because Jacob and John married sisters (Elizabeth and Angelina Coddington), John’s connection to the family seems probable. Jacob sold land to Jeremiah in 1826 and Jeremiah appears in the Warren Co. tax roles, along with John (and a Frederick Bysher) as late as 1832. (We infer from this that Jeremiah continued to own property in Ohio subsequent to his move to Indiana.) Simeon Jacob Beisheir of St. Louis is also clearly Christopher's son based on his 1879 marriage record which provides the names of Simeon's parents and Y-DNA evidence. Given these considerations and a mounting collection of Y-DNA and autosomal DNA evidence, it seems highly likely that all of the Bishirs in the Warren Co. records during the 1820s were closely related, and probably Christopher’s children. By 1830, Jeremiah and his wife, Hester, and at least one child had moved west into Indiana, where he raises an enormous family of as many as 17 children in White Co., Indiana. 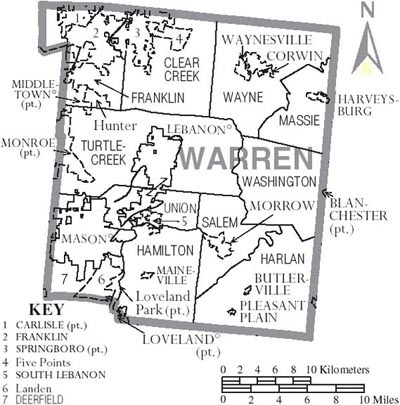 It’s probable that Elizabeth Bishir Thompson remained with her husband in Warren and Simeon may have remained in Cincinnati with his mother and eventually wound up in St. Louis in the 1850s, but the rest of the Bishir families moved in 1828 and 1829 to Highland County, 40 miles southeast of Warren Co. Although John Bishir moved to Highland Co. with his brothers Christopher and Jacob and purchased land there in 1832, in 1834 he sold his land and followed his brother Jeremiah to Indiana. John’s wife, Angelina, died in Indiana in 1844 and he then returned to Warren Co., Ohio to live near his in-laws, the Joseph Coddingtons. Jeremiah Bishir’s oldest children reported having been born in Highland Co., but it does not appear that that family ever lived there, since there are no land records in Jeremiah’s name and he does not appear in the census there – it is more likely that his eldest son, Miles, was born in Warren Co.
By the time the Bishirs arrived in the area in 1830, the town was being formally platted. 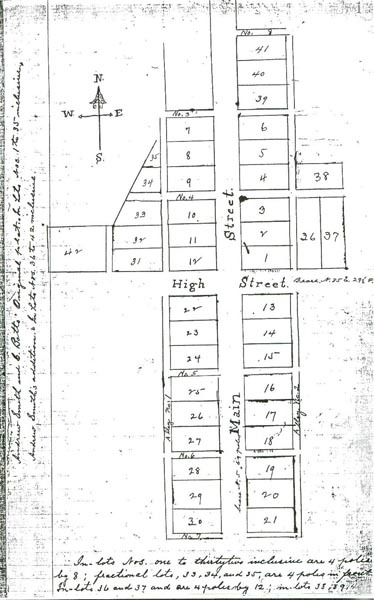 There were 42 town lots laid out on the plat, clustered around Main and High Streets. 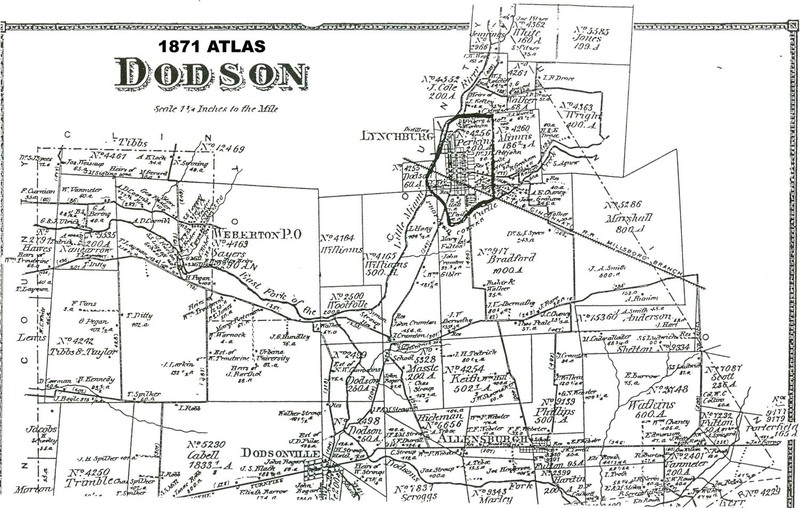 The village was formally founded on July 27, 1830 and Dodson Township was laid off the same year. A number of newcomers arrived in the following few years and they built more houses, two stores, and a blacksmith shop. There was also a doctor, shoemaker, and a Justice of the Peace. "The Christian Church was organized in the woods a quarter of a mile south of town in August, 1838 on the Abraham Gibler place. The preachers at the organization were Rev. Walter Scott and Rev. L. H. Jameson. Among the early members were Mr. and Mrs. Milligan Clark, Mr. and Mrs. Alfred McDaniel, Martha Eaglin, Ruth Burton, Christopher Bisher, Betsy VanMeter and daughter, Mary. Meetings were held mostly in a cooper shop belonging to Charles Bishier, just south of Turtle Creek. A church was erected in 1841, a frame building on the west side of Main near the railroad at a cost of $500. The dimensions were 26 x 40 feet. It burned in 1851." In 1851 Lynchburg was incorporated and had elected its first mayor. Sometime later its major industry was established when, in 1857, construction began for a distillery on Miami Creek just north of town. 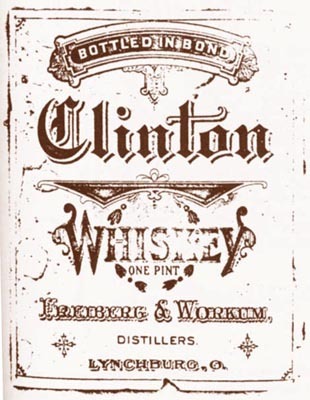 Prior to its completion the business was purchased by Julius Freiberg and Levi J. Workum of Cincinnati, and the firm began production of Bourbon whiskey the following year. 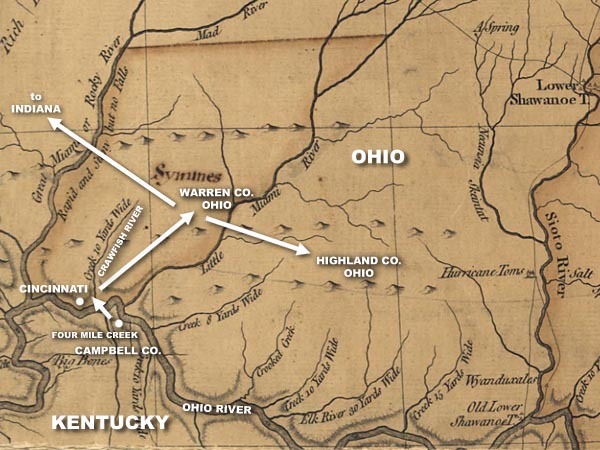 When the Civil War broke out in 1861, a number of companies were raised in Highland County. 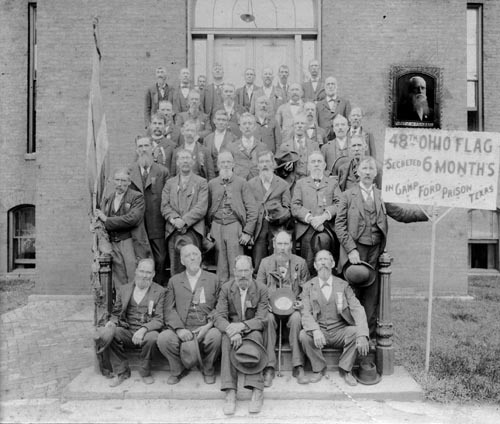 Several Bishir men from the Lynchburg area joined the 48th Ohio Volunteer Infantry, the 24th OVI, and the 192nd OVI and were active in the Lynchburg and Hillsboro GAR posts after the war. Jonathan Bishir, a former U. S. Dragoon, was almost 50 years old when he enlisted in the 24th OVI. After one year he was discharged due to "overage and lumbago" and promptly signed up for the 2nd Ohio Cavalry. He was captured during Gen. Wilson's raid around Petersburg and spent ten months in Andersonville. Despite a host of disabilities brought on by these experiences, he lived in the Dayton National Soldiers Home until 1887 - a tough old fellow!. His son, George and Christopher Jr.’s son, William Sherman Bishir, served with the 48th OVI and fought at Shiloh and Vicksburg and were captured during the Red River Campaign in Louisiana in May of 1864. They suffered physical disabilities for the rest of their lives as a result of their months of exposure in a Confederate prison in Texas. Apart from farming, the principle occupation cited for the Bishirs in the Highland County censuses during the 19th century was that of cooper. Coopers were highly-skilled craftsmen who could produce all manner of barrels, casks, hogsheads, and buckets. 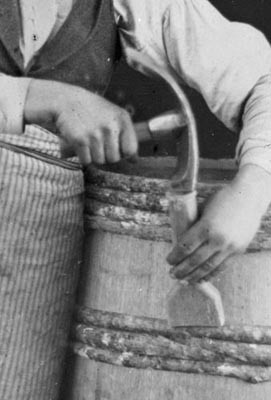 Today we associate barrels with wine and spirits making, but in the 1800s and earlier, a vast array of goods was transported and stored in barrels: pickles, meats, eggs (packed in straw), crackers, flour, gunpowder, tobacco, as well as liquids of all kinds, from turpentine to milk. Barrels could be rolled off ships, floated down rivers, and easily stacked and carried on wagons, while their contents were sealed inside, safe from the predations of vermin or exposure to the elements. Barrels could even be cut in half to provide a food trough for livestock or a cradle for an infant. The coopering craft was passed down from generation to generation among the Bishirs throughout the 19th and into the 20th centuries. “Tight Coopering” for liquids (as opposed to “Slack Coopering” for dry goods) was a particularly painstaking craft, and it is certain that this was the mainstay of business for our Bishirs, since their principle customer for many years had to have been the Freiberg and Workum Distillery in Lynchburg. 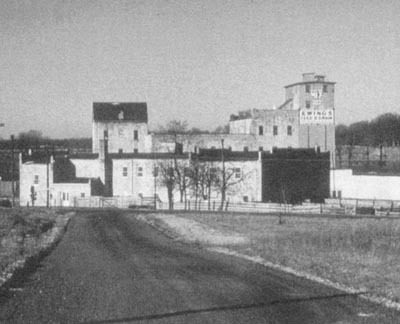 Indeed, whiskey production defined Lynchburg’s economy for more than 50 years – it became known as the whisky town, and the local baseball team was “The Distillers.” All of the barrels for the distillery were made in town, initially on a lot on Bobbit Avenue, and later on the grounds of the plant itself. Just prior to World War I, the temperance movement had gained so much ground, that there were annual attempts to pass a state law to prohibit the production and sale of liquor. 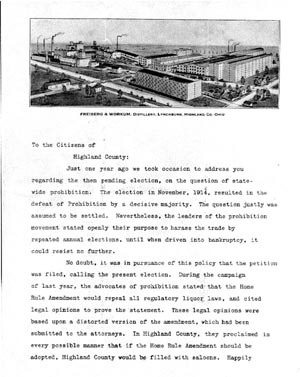 In 1915, Lynchburg’s Freiburg and Workum Distillery felt so hard pressed that they issued a public letter begging voters, and especially those whose jobs depended on the industry, to vote against such legislation. 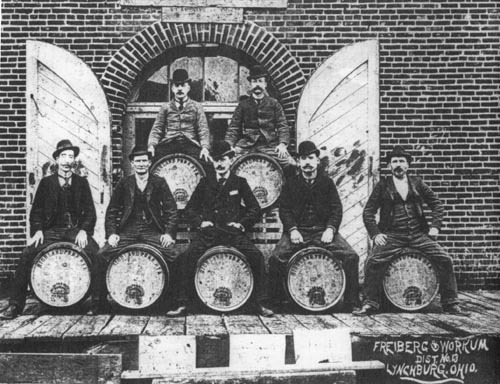 When national prohibition was passed in 1918, Lynchburg was dealt an economic blow from which, in the opinion of many of its old-timers, it never recovered. About the time of the closure of the distillery the last of the Bishirs remaining in Lynchburg moved on. Many of Jacob Bishir’s grandchildren had already moved to Illinois around the turn of the century. 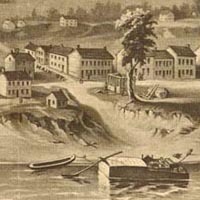 Others had moved to Clinton Co., which was just across the Lynchburg covered bridge over Miami Creek to the west, and some went further north to Xenia where there was a thriving rope-making industry. 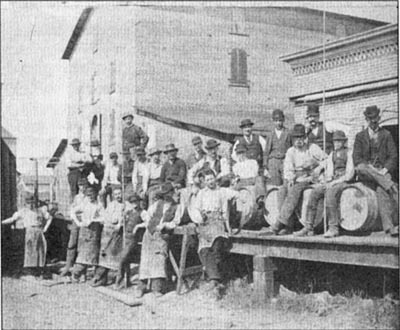 Others sought coopering jobs on the riverfront in Cincinnati and Kentucky where there was still some demand for their skills. 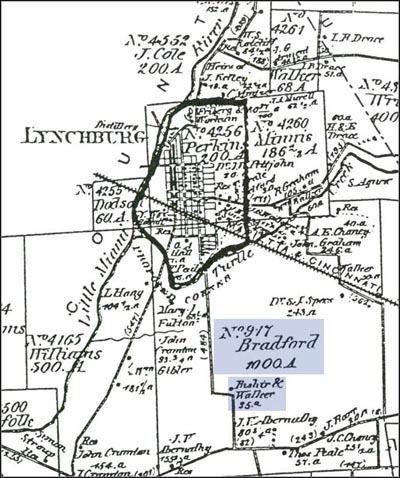 By 1920, nearly all of the Bishirs had left Lynchburg, but their ancestors remain behind, in cemeteries in Highland Co., Ohio, where they had lived for most of their lives. Today, Jonathan Bishir’s sons, George and William can be found with their Civil War markers in the old F&AM Cemetery just north of Lynchburg, and Major Christopher Bishir lies in town in the Masonic Cemetery with his brother, Jonathan and his wife, Elizabeth. Jacob is buried in the Olive Branch Cemetery in Hillsboro. 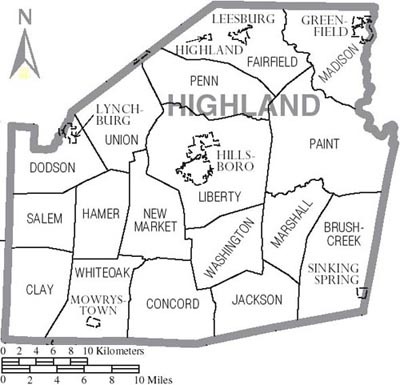 For nearly 100 years, Highland County had been home to several generations who could claim “Christly Bysher” as their ancestor. 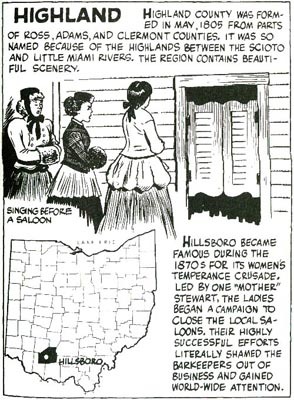 Lynchburg, Ohio: A Large Story About a Small Town, Hugh Isma Troth, 2000.